This marks the third film in Fox’s half-reboot, half-prequel trilogy of X-Men films. It features such a jumble of recast characters and rehashed plotlines it’s hard to comprehend how everything is supposed to fit together across all the X-Men films up to this point (or if it’s supposed to fit together at all). If you’ve been watching all the movies and expected them to utilize this new trilogy to build to where things were at the beginning of the first X-Men film, it’s clear Fox has no intention of doing so. Continuity has been broken early and often. “Apocalypse” begins with a bizarre sequence that combines ancient egypt with futuristic looking pyramids with embedded light patterns. The setup for the villain (Oscar Isaac) is to show him utilizing his unique ability to transfer his consciousness into another body. We’re assured it’s a process that’s taken place many times over. Each time he takes the body of yet another mutant thus claiming their unique features for his own. As such, he is a nebulous character with ill defined abilities. I began to wonder how his previous body’s mutant powers could be transferred in addition to his consciousness, but then I realized I was asking the questions I wasn’t supposed to. Yet the next scenes only left me with even more questions. Circumstances lead to Apocalypse’s burial beneath vast amounts of rubble, where he remains resting until a group of unnamed fanatics for reasons unknown, magically, perhaps inadvertently, wake him. He’s known as the first mutant and he has an unremarkable plan that sounds vaguely similar to the one Ultron had in the last Avengers film. Though this time it involves the destruction of modern society so as to create a new mutant ruled utopia. And much like “Age of Ultron” he’s joined by a few powerful individuals, but it’s clear at least a couple of them might be in over their heads. Despite all of the loud CGI action, this comes down to some very generic superhero tropes. There is not one compelling action sequence and not one thread of this film that doesn’t feel like it’s been done before in either another superhero film or by this very series. And because it has to move so quickly from one character to another and one action sequence to another, very few if any of the characters feel like they get their due. 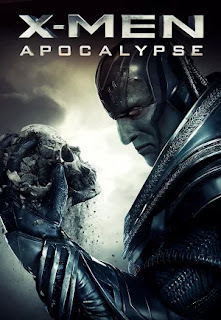 Apocalypse is poorly established. All the new faces feel like they get extremely rushed and underdeveloped origin stories. And the returning faces don’t get quite enough screen time to feel like their individual plotlines truly matter. Young Jean Gray (Sophie Turner), Cyclops (Tye Sheridan), Nightcrawler (Kodi Smit-McPhee), Storm (Alexandra Shipp), Angel (Ben Hardy), and Psylocke (Olivia Munn) and a few others join the cast getting varying degrees of origin stories and screen time. But rather than fully develop any of them, the film spends more time with characters we already know fairly well at this point. I'm not sure I can stomach another movie in which Magneto begins the film a good guy, turns evil, and requires Charles to help him see the light. But sadly that's only one of the things repeated here. This film is bloated with too many characters but too little for them to do. Where Marvel finds ways to incorporate all of their numerous characters in interesting ways, Fox leaves a lot to be desired. Where Marvel creates action sequences that utilize the various unique powers in interesting and sometimes visceral ways, it’s clear Fox doesn’t know what to do with its heroes. More often than not the powers at play feel like plot contrivances as each hero present at any given moment just happen to have a particularly useful skill given the circumstances that have just arisen. The most noticeable offense involves Jean Gray pulling aside Nightcrawler and Cyclops just in time to miss a kidnapping attempt. Conveniently the three who escaped kidnapping just happen to have three skills perfectly suited to helping with an escape scene later (an escape scene that feels shoehorned in strictly for fan service, as it contributes nothing to the story here). The film also very blatantly recognizes that it’s set in the 80’s. There’s a nod to a particular 80’s film, one character plays Pac Man on an old arcade machine, and everyone’s attire screams the 80’s. As such I can’t help wondering if it was deliberate that the film feels like a mixtape of certain bits of the past films in the X-Men series. They don’t always fit well together or feel necessary, but they’re thrown into this mixtape nonetheless. It isn’t as though there aren’t some well executed sequences, but not even all of the good ones feel like they belong in this film. Some of the ideas here might have been interesting had they been fleshed out in their own film rather than stuffed in a haphazard manner into a film trying to do too much. I understand that with characters who have such colossal powers it’s hard to keep from building an equally colossal threat, especially when there seems to be an unwritten rule that requires continually escalating threats with each new film. But we’ve just seen another hero franchise do something smaller and more personal. This franchise needs to follow suit in a bad way.